«©NCSX» Even though the new Batman Kubrick and Bearbrick toy makes the Gotham City crusader appear constipated, we're going to keep a set for our Kubrick collection anyway. Batman measures 7cm or 2.75" in stature and is decked out in the new battle armor from the recent Dark Knight movie. According to a short scene in the film, the new armor allows Batman to turn his head which makes it easier when "backing out of the driveway." 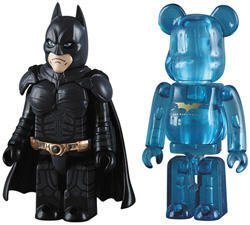 Along with the Batman Kubrick, Medicom also includes a translucent blue Bearbrick figure which features a golden bat silhouette across its chest. Sort of like a Bear Wonder sidekick of sorts.